President Moon Jae-in on Wednesday met with US Director of National Intelligence Dan Coats in Seoul to discuss bilateral issues, Cheong Wa Dae said. 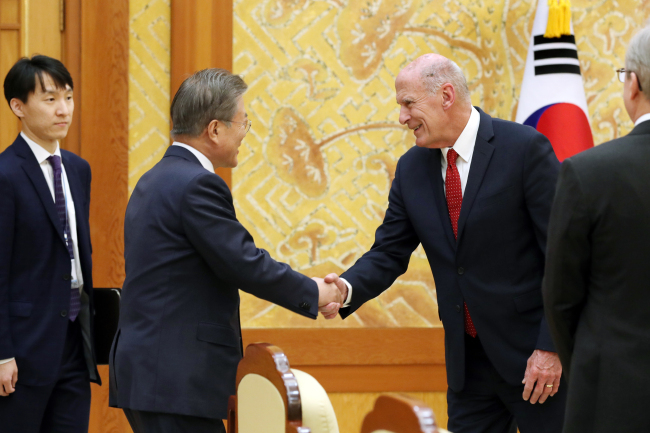 Coats’ visit is seen as aimed at sharing information and assessment of North Korea following the breakdown of last month’s summit between the two countries. Earlier, a local newspaper reported that Coats arrived at a US air base in Osan, south of Seoul, Tuesday night for a three-day stay. The government source confirmed his arrival but declined to elaborate further. His detailed schedule in Seoul has yet to be confirmed, but he is likely to meet his South Korean counterpart, National Intelligence Service Director Suh Hoon, and other senior officials. The trip came after North Korea repaired its Dongchang-ri long-range rocket launch site that was partially dismantled last year. That led to concerns that the rebuilding could be a sign Pyongyang may be preparing a missile launch. Last week, North Korean Vice Foreign Minister Choe Son-hui threatened that Pyongyang may stop nuclear talks and resume nuclear tests and missile launches, saying it has no intention to give in to Washington’s “gangster-like” demands. North Korean leader Kim Jong-un and US President Donald Trump met in Hanoi, Vietnam, in late February, but failed to strike a deal as they differed on the scope of denuclearization steps from Pyongyang and reciprocal concessions, including sanctions relief, from Washington. In January, Coats told the US Congress that he believes it is unlikely the North will completely abandon its nuclear weapons program because Pyongyang views the program as critical to regime survival.